Israel’s Sea of Galilee (Lake Kinneret) was still at critical water levels as recently as January, when a previous article depicted the then dire condition of the biblical lake. So critical in fact was the crisis that the lake’s water level had decreased so low that it nearly reached the dreaded “black line” of 214.7 meters below sea level when the water becomes saline, due to underground salt springs. 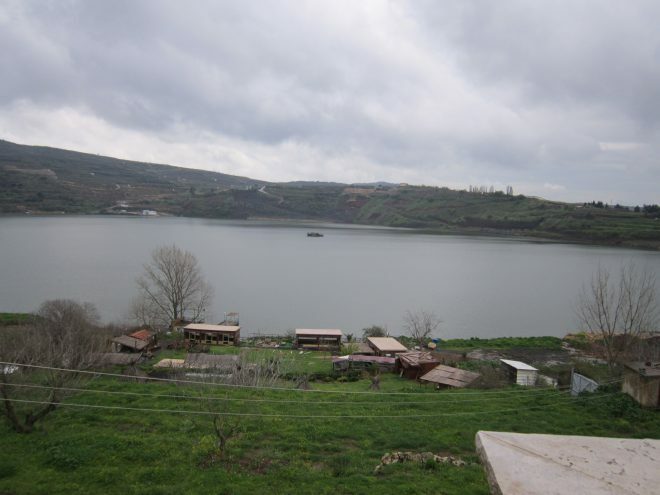 The overall situation of the Kinneret has now improved significantly due to recent heavy rains which have also fallen on the Golan Heights, one of the Kinneret’s sources of fresh water. This situation prompted me to go on a day trip to the “Heights” and check out the situation there; especially the beautiful waterfalls of the Saar Stream, also known as Nahal Saar. 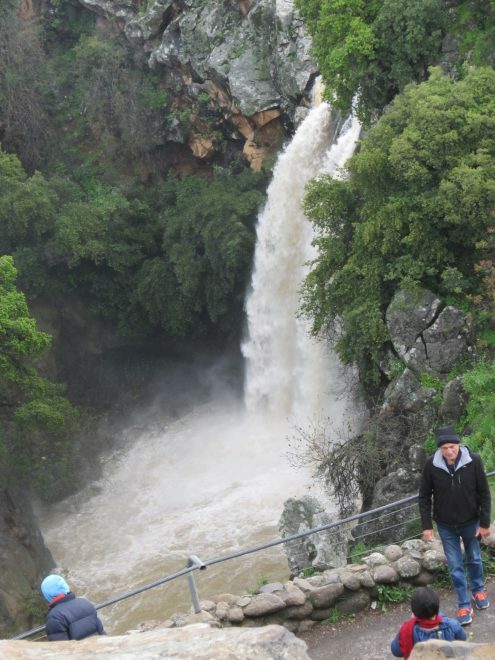 Starting out from central Israel on a rainy April 1, a virtual April fools joke in itself in drought plagued Israel, our group’s first nature stop was none other than Nahal Saar itself, to view the now swollen stream and truly spectacular water falls. As we approached the stream on foot, a near-deafening noise of rushing and falling water was emanating from it, as shown in a close-up view of the top of the falls (photo). Before reaching the Jordan, Nahal Saar flows through the historic site known as the Banias Nature Reserve, itself a natural wonder with smaller waterfalls and ruins of ancient settlements; including a site said to have been a place of worship to the Greek god Pan. Mt. 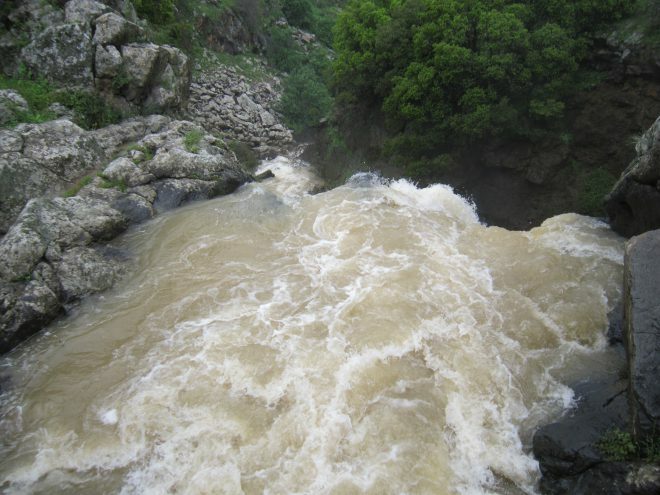 Hermon, the Golan Height’s highest mountain range, is a major source of water for the streams that eventually feed into area rivers, including the Jordan and Yarmuk rivers. This season’s precipitation have added considerably to the snow accumulation atop Mt. Hermon, from which the melting snowfalls feed into these streams. Our tour included a visit to a small lake called Birkat Al-Ram, called Bherkat Ram in Hebrew. The picturesque lake is actually the flooded cone of an extinct volcano. The lake has been in danger of drying up due to excessive pumping for agricultural use. greatly improved the Kinneret’s situation over what it was previously. Currently, the lake is only supplying water to neighboring Jordan, as part of the 1994 peace agreement with Israel. “Israel’s fresh water now comes from mountain and coastal aquifers and desalination” our guide said. The current lake level of -211.8 meters below sea level is still about 3 meters short of being completely full and reaching the “upper red level” of -208.8 meters below sea level, when excessive water is sent into the lower Jordan River. The lower Jordan, now not much more than a thin trickle of “unholy water” from sewage and saline runoff, can use a bit of Kinneret lake water as well. Water crises at Sea of Galilee. What would Jesus say?